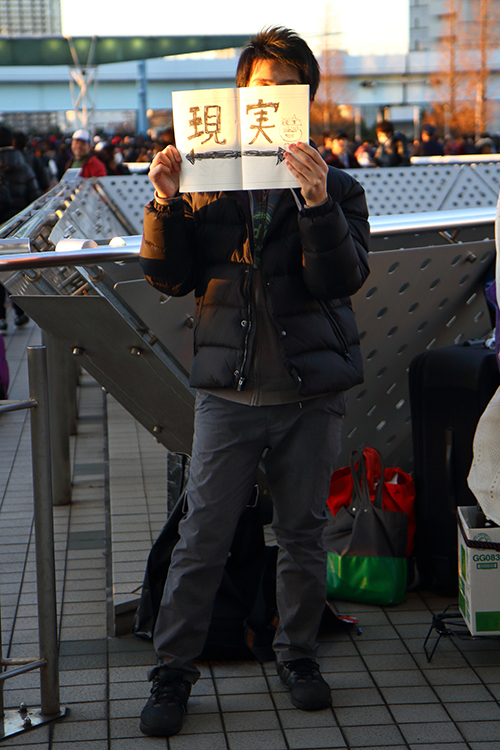 Comiket (コミケ) is “Comic” + “Market”, but having experienced a few, we felt that it definitely extends to more than that. Thinking about comics and doujinshi is just the surface, and so Haruta and I decided to plunge deeper. This is what this year’s coverage is mostly going to be about. Firstly, let’s get the usual things out of the way. This year’s doujinshi had the usual top runners still on top: Kancolle (艦これ), Touhou Project (東方), Touken Ranbu (刀剣乱舞), iM@S, and Fate/Anything (and its spinoffs like Prisma Illya). Corporate booths had a really long queue for Gochiusa (ごちうさ), and the Grandblue Fantasy (グラブル) dakimakura (released ONLY on D2) sold out really fast. 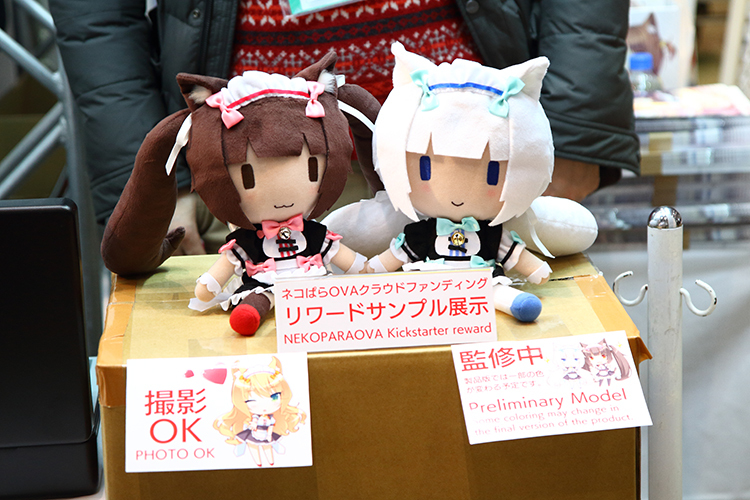 Nekopara was also present, and had cosplayers for each of the characters. 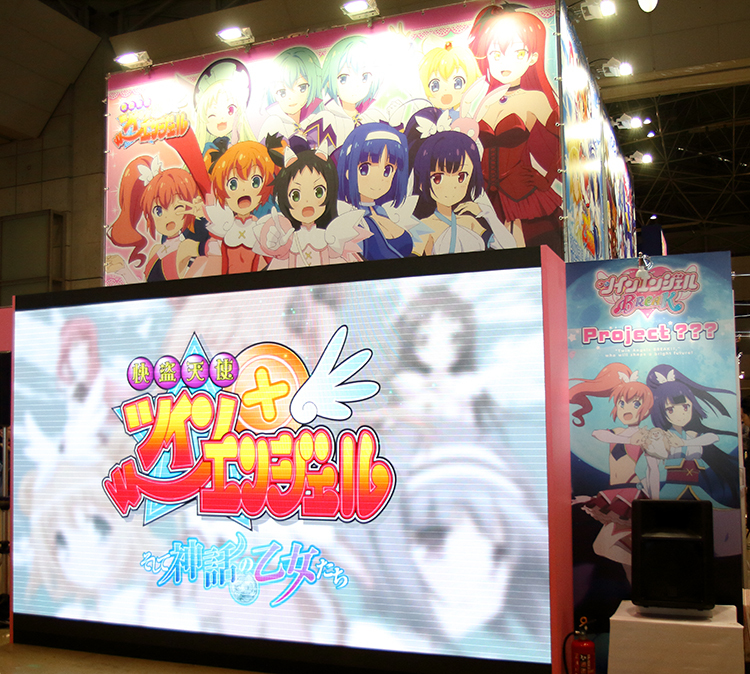 Kaitou Tenshi Twin Angel (快盗天使ツインエンジェル) was promoting its next season. It’s been a long time! Making a comeback after 6 years is Kaitou Tenshi Twin Angel! 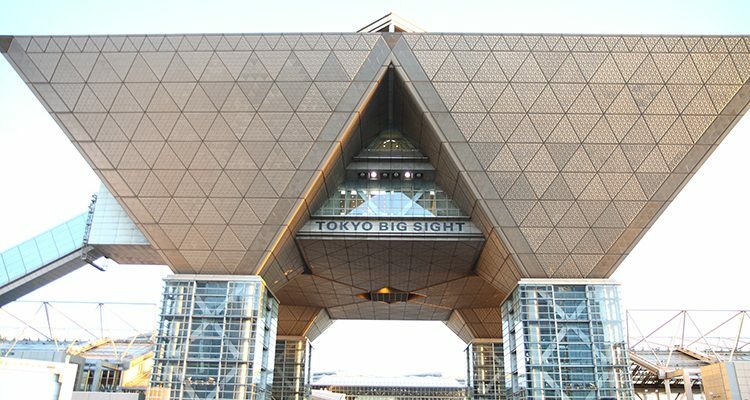 Secondly, if you didn’t already know, Tokyo Big Sight has now expanded by putting up another “double” hall. This year had 東7 (booths) and 東8 (changing room). 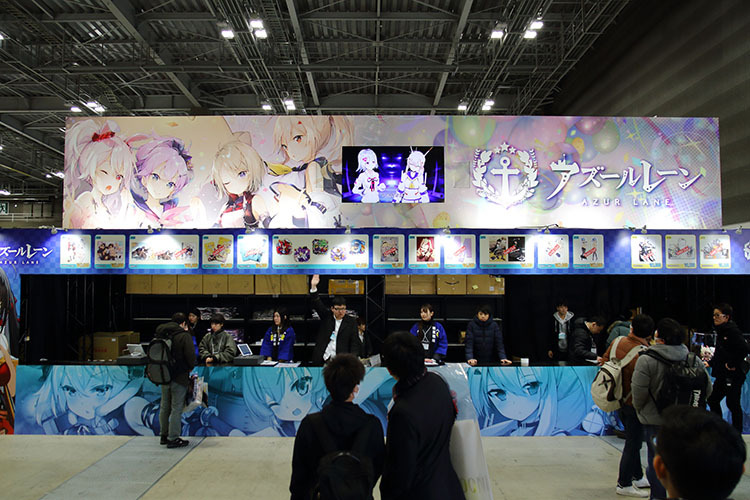 To take advantage of the new space, both the doujin booths and corporate booths have expanded. The new hall is still plenty spacious, which means that there’s still room to grow. Needless to say, Comiket is still war. Number of counted visitors this time was 550,000! (Not counting those not in the main queue after noon or so.) And the booth count was 35,700! The most ever! Now, something interesting before we carry on. 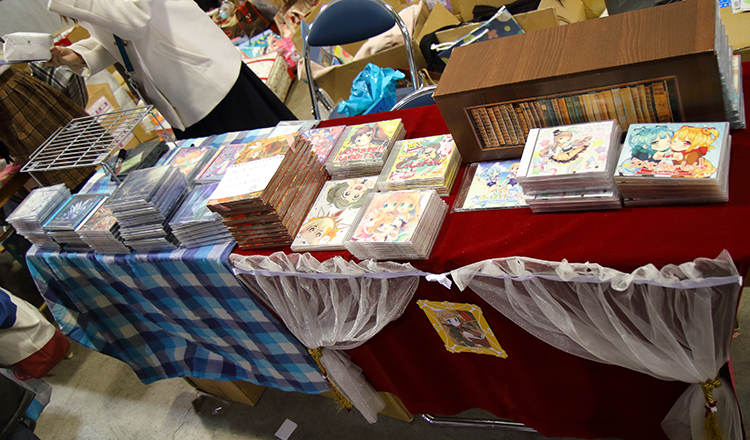 Before the shutters were lifted to start the day, on D3, I had the chance to personally witness one of the doujin booths having 2 of their doujinshi barred from sale because it was just too NSFW. Think about that for a moment. (You may need to have seen some R18 doujinshi to understand what I’m talking about here.) And the reaction around me as the news spread was like “え？”, “まじ？”, “もう？”, and “www”, or a mixture. So let’s start the dive, and let us bring you first, to D3, 西１. This is the place for non-doujinshi stuff, and there are a great many things to keep your head turning. 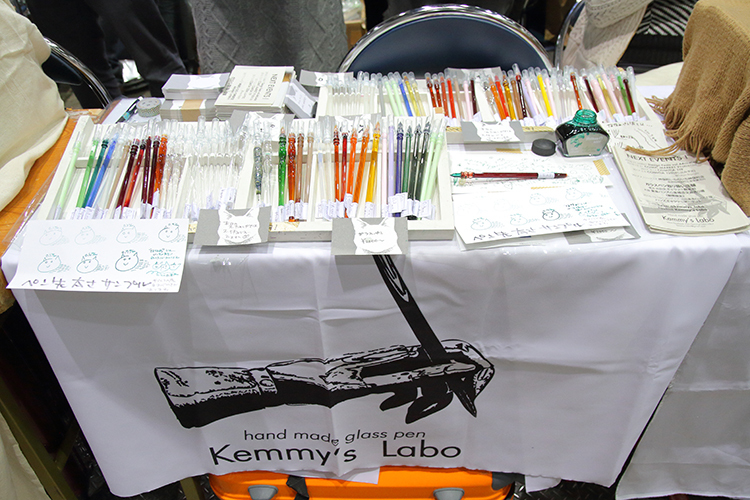 Last year I wrote about homemade headphones, this year I’m going to show you glass pens. These behave like quills where you dip them into ink, and the surface tension holds the ink on the nip while accumulating just enough at the tip for you to write! I saw people trying it out and I’m impressed at how consistent the thickness of each stroke is. 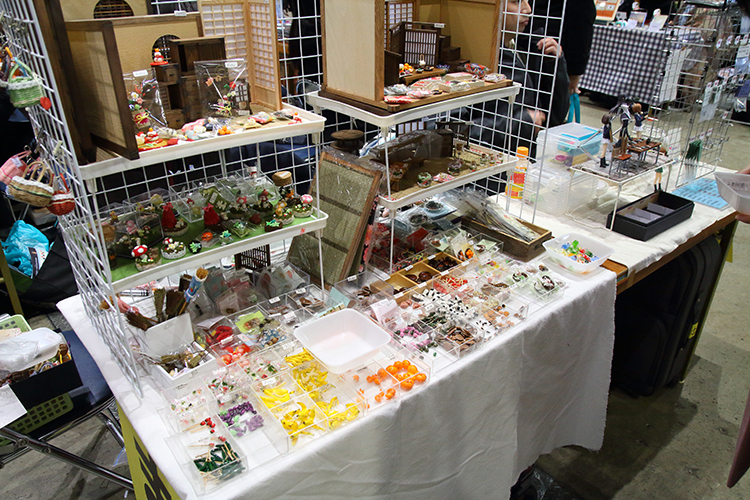 Well, there’s not just glass pens, miniature models for your Nendoroids and other similar-sized figurines as well! Check these out! Beautifully crafted; each and every single miniature! Perfect for Nendoroids. Check out close-ups on her Twitter! 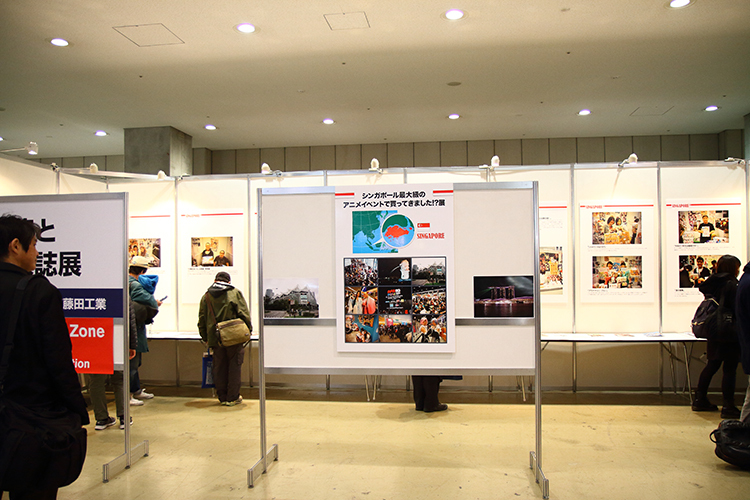 Camelia (かめるかめりあ) [left] & Confetto [right] booths, which had pretty long queues at the start of the day! D3 at 西１ will never be boring, and I’m sure there will be loads more that I can feature each year. But let’s move on a little. 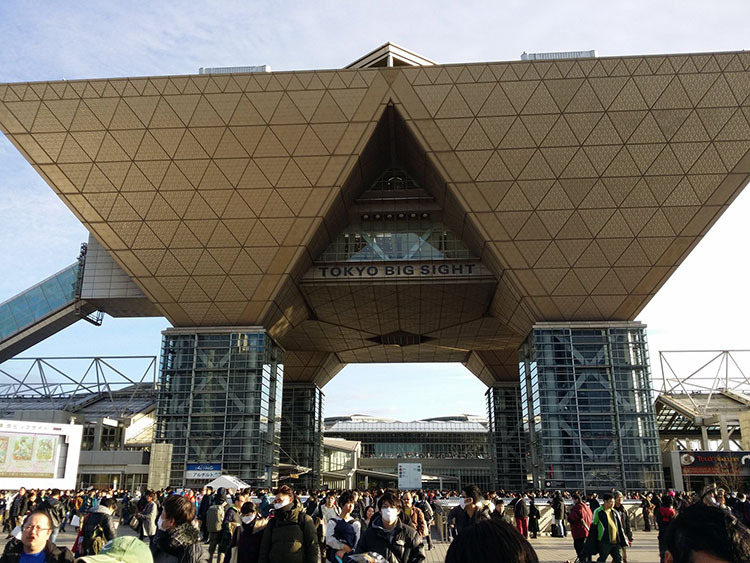 Comiket is getting more and more international every year, as they reach out to other countries with blooming culture and other countries reach in to Japan. The Comiket Official Page on Facebook said that they had probably just gotten the most number of international visitors yet. 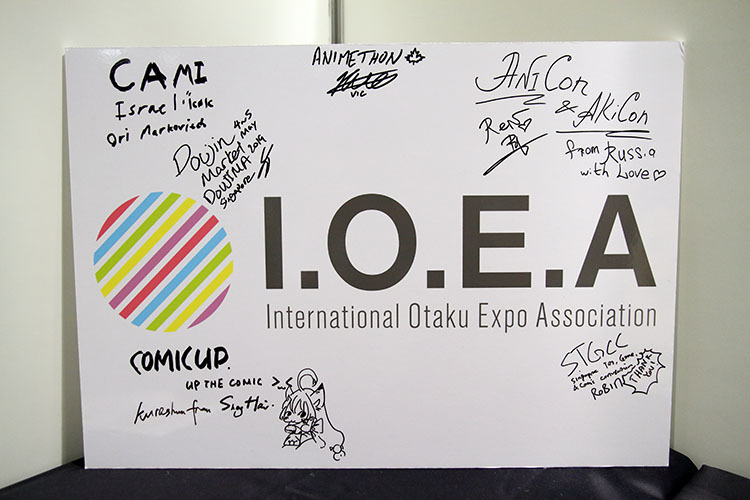 And this year, as part of their International Otaku Zone, they featured Singapore. Pictures and short paragraphs describing what otaku conventions in Singapore are like. 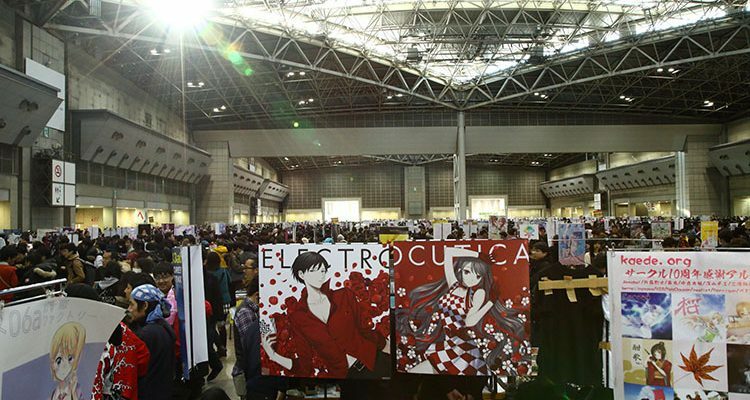 The Japanese have probably heard some stuff about Singapore, most likely something to do with that lion with a fish tail (and you can juuust see it in that picture in the middle), but having a zone like that at Comiket is something I’d say I’m somewhat proud to see happening. Let me now take you outside. 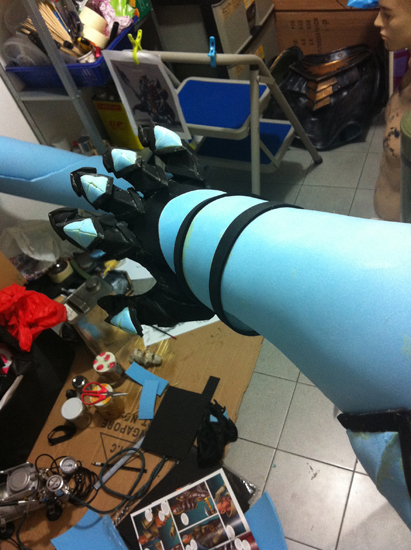 To the cosplay areas! You can find cosplayers just about anywhere outdoors, even mixing with the queues for the booths as seen here! Comiket is never complete without talking about the cosplay. From swimsuits to armour (the proportion of which swings depending on the temperature), there is a really great number of cosplayers that it makes perfect sense to chillout after hitting your popular booths (most are sold out around noon to 1pm anyway) and have a really long look around. 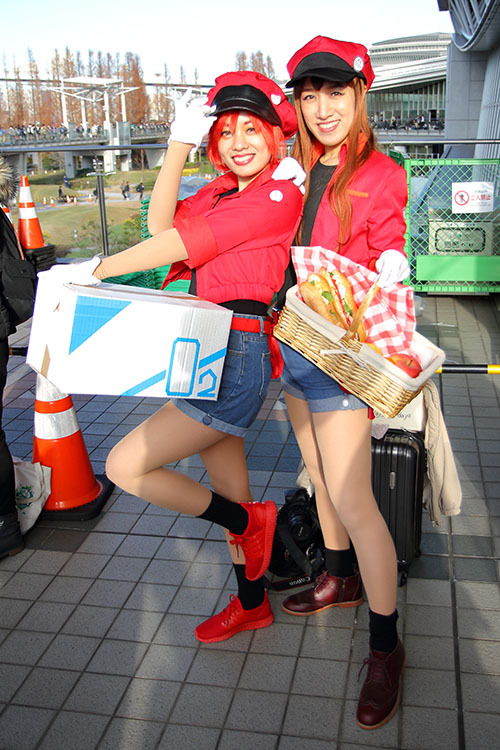 You’ll also see endless blogs, tweets, and posts online of all the different cosplays each time Comiket comes around. This time, we took a plunge deeper as well, and Haruta interviewed two of these cosplayers. First up, we have Shimizu Taichi (清水 泰地). Feast your eyes on those muscles! Get more on his Twitter! A professional body builder who’s put his muscular body to good use for his hobby, Shimizu has always loved anime and manga since young. One day it suddenly occurred to him that his body figure is similar to some of the anime and manga characters. So he decided, why not cosplay these characters? Thus he debut during Summer Comiket 2015 as the green superhero Hulk from Marvel Comics. 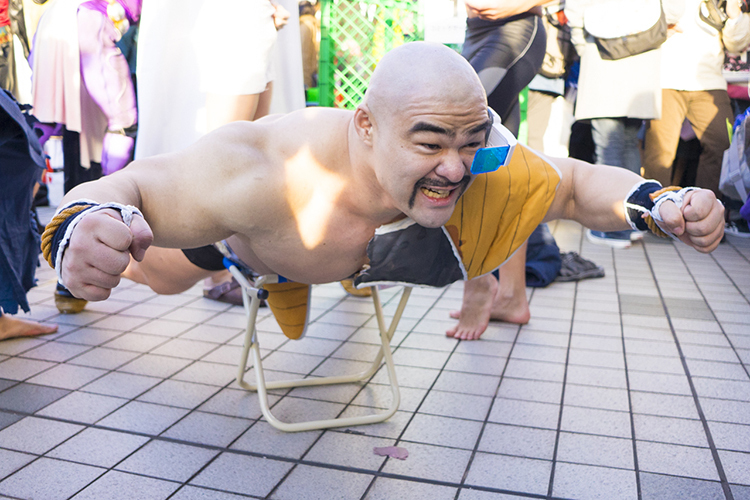 Since then, Shimizu has cosplayed several other characters, such as Alexander the Great from Fate/Zero, Broly from Dragon Ball Z, and his most famous, Zangief from Street Fighters. When asked what his next cosplay plan is, Shimizu said he hadn’t thought about it yet, but he’s most likely bringing it out during Summer Comiket 2017! With that, Haruta left him to put on a coat (remember it’s winter!) as he takes a break from posing as Nappa from DBZ. 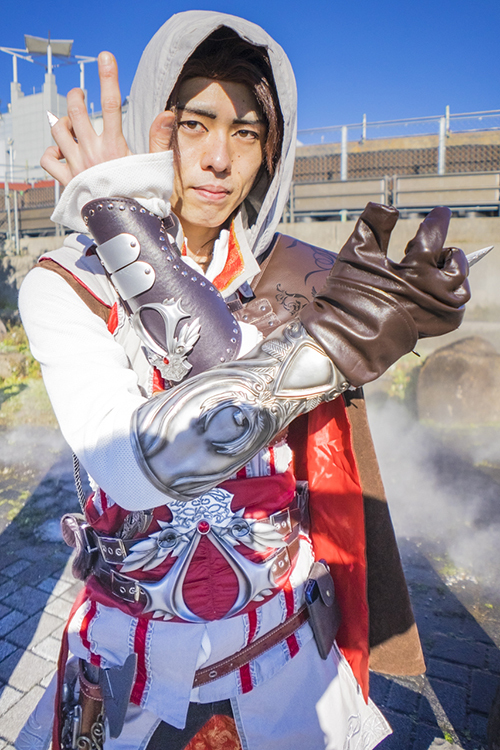 Next, we have a newbie to the Comiket scene, Kuro, as he cosplays Ezio Auditore da Firenze, from Assassin’s Creed II! Ezio Auditore da Firenze. Kuro’s a newbie, but goodie! 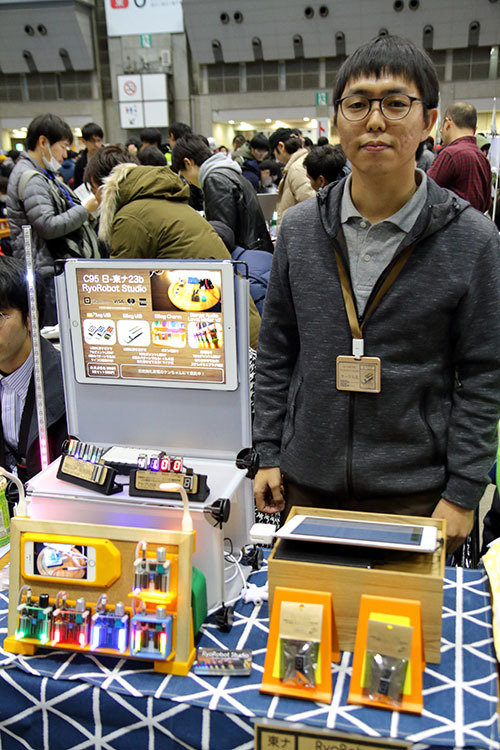 Although being his first time debuting at Comiket, Kuro is no stranger to cosplay, having dabbed in the hobby for around one and a half years. His first cosplay was Kotetsu, from Tiger & Bunny, in his casual everyday wear. When asked for his reasons for starting cosplay, Kuro said that he went to a party with his upperclassmen, where everyone is a cosplayer. Due to the influence, he decided maybe he should give it a go, and since then he hasn’t stopped yet. Kuro also has a passion for swords, and thus likes cosplaying characters carrying a katana. Kuro has cosplayed several Hakuoki characters as such, and more recently, Mikazuki Munechika from Touken Ranbu. Kuro plans to challenge a different type of characters by cosplaying someone from Idolish 7, though which one specifically, he hasn’t decided yet. When asked how long does he see himself continuing the hobby, Kuro said the future is still uncertain now, so for the time being he’s going to try for another two to three years, then take a look again from there on. Every cosplayer has a story, and realising that (while looking at the numbers), you can start to see why this post is a deeper dive. But of course, we can’t carry that many stories (nor pictures) in one post, so head on over to our Facebook page for a larger album of cosplayers! 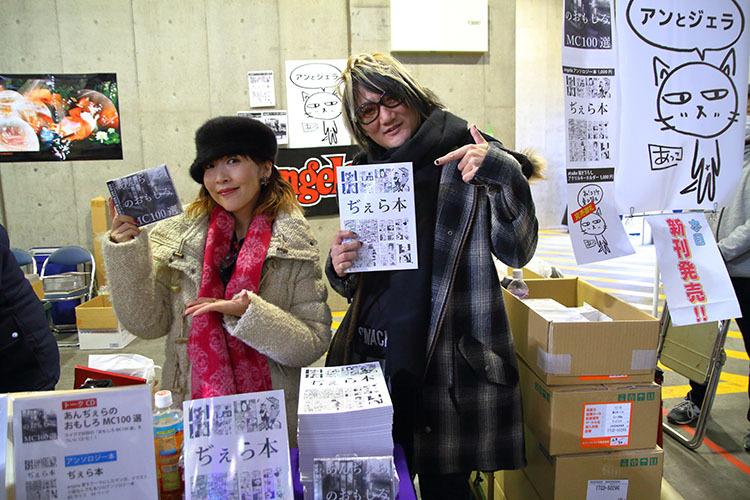 Comiket is much more than just comics and commercial booth merchandise (limited edition or not!). 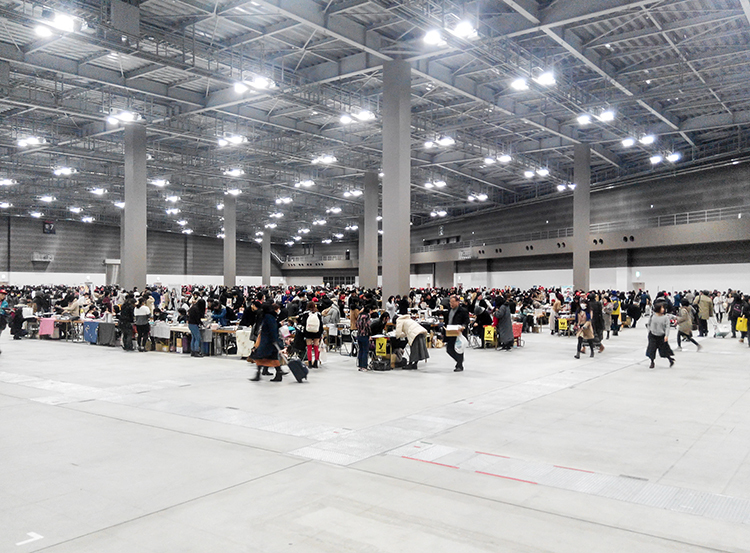 I’d like to reiterate what I’ve said before, and this is the view of the organising committee: Everybody at Comiket is a participant. There are no sellers, no buyers. 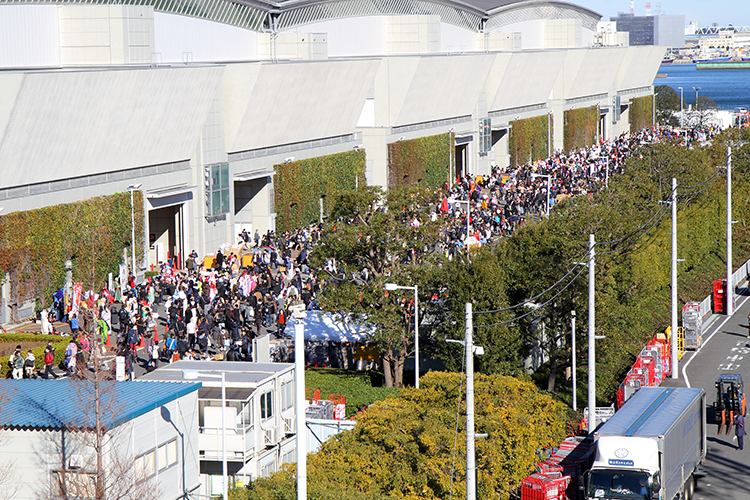 You see, Comiket is made of its people. Coming together, sharing such a huge passion for whatever they have (really whatever as you would have noticed by now), every single person there adds to how awesome this event is, and everyone is there to enjoy themselves. 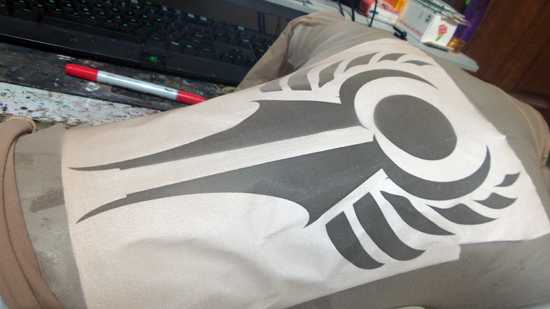 Even the rush for limited edition stuff are all done very nicely, very “politely” if I may say. And let us not forget the volunteers who work tirelessly for 3 days straight to guide the crowds. Their crowd control and systems they put in place are absolutely amazing (this one you can only understand once you personally see it). Update: Due to bandwidth issues, this tutorial has been replicated on Facebook. You can access the complete tutorial here. Recently, we discovered a simple method to transfer printed images onto EVA and we’re pretty excited since it makes replicating filigree and complex patterns so much easier. If you’d like to try your hand at it too, here’s a simple tutorial detailing the steps we took. Mix Latex glue and White acrylic paint together. Prime your EVA surface with a single layer this mixture. This is to prepare it for the transfer process. 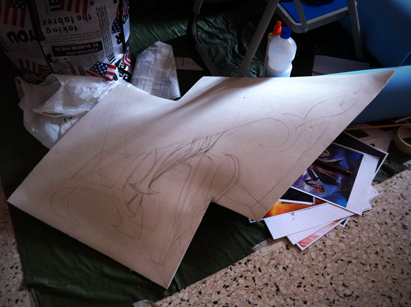 Create the pattern or graphic you’d like to transfer onto EVA in graphic software. Don’t forget to flip the image horizontally, because you’re printing the mirror image of this file onto the foam later. Print the file out on reasonably good quality paper. Also, make sure you’re using a toner based printer (laser printer) rather than an inkjet as ink might not transfer well. 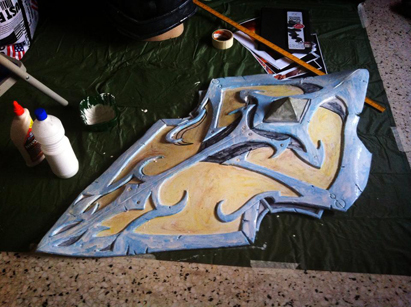 Coat the primed surface of the EVA foam with Acrylic Gel Medium. Gel Medium is what you’ll use to create the transfer, and you can purchase it at most art supply stores (such as Art Friend and Straits Art Co.). Let the gel set for a little while, and apply your print out to the gel covered foam. You are essentially ‘pasting’ the print out to the foam with the acrylic gel. Be sure to align your printed image properly, because this is a one-time process. Peeling off the printed image will ruin the process and you’ll have to start over. Once you’re done, leave the project to dry for a day or so. Immerse the foam with the print transfer in water. Soak it until the paper begins to fray and dissolve (usually about 15 minutes) and gently rub it off. This part of the process is the most time consuming, and requires both patience and a steady hand. Give the surface of the foam a good rinse after you’ve peeled off all the paper to get rid of stubborn fibers. Pat dry the surface with paper towels, and leave to air dry. 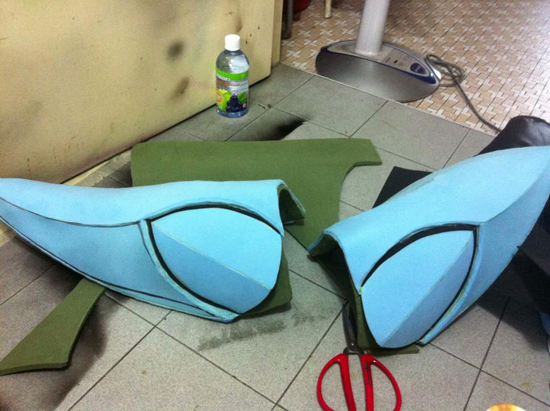 Finally, seal the surface with acrylic lacquer and you’re all set for further crafting and embellishments. 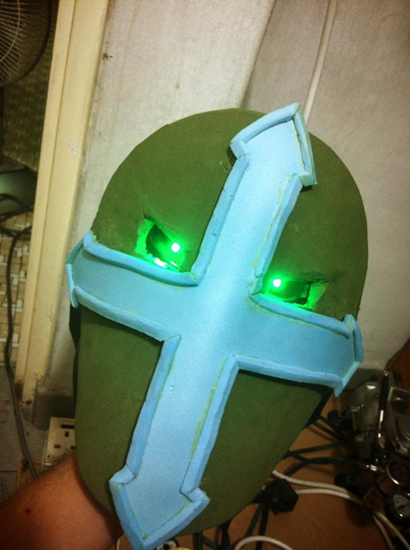 With Diablo being one of our favorite series, we were really excited about trying our hands at building something related to the new Crusader class. So when Vaeflare, who also featured our Demon Hunters awhile back put up some incredible visuals by Hungarian digital painter István Dányi, we were sold. István Dányi’s awesome crusader art, which was featured on the Blizzard site. 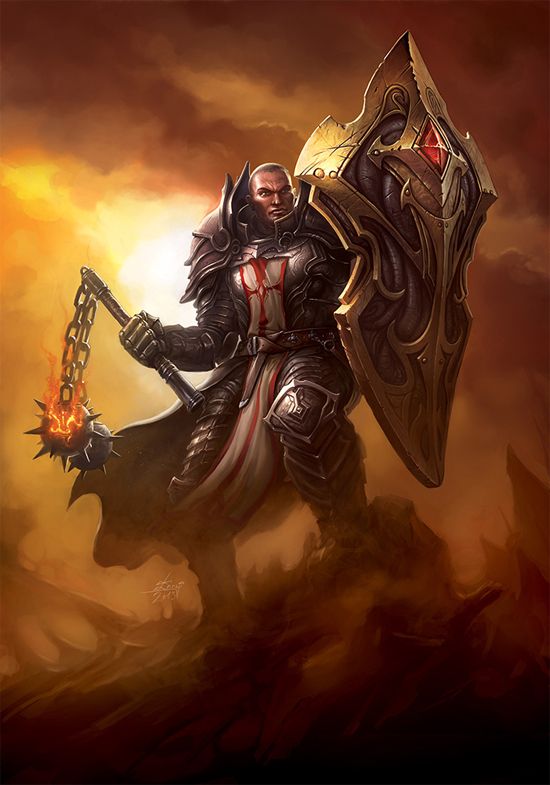 This amazing piece, titled ‘Crusader – Unbreakable Warrior’ and the shield that the righteous knight toted soon became the inspiration for Crimson’s Crusader shield, which he lugged to the Diablo III: Reaper of Souls launch on Tuesday. 4. Drawing implements e.g. markers and tracing paper. Make sure you’ve got a good idea for the shape and design of your shield. First, draw the base shape on a piece of tracing paper, followed by any possible adornments on the shield onto a separate piece. You will need these templates for later. 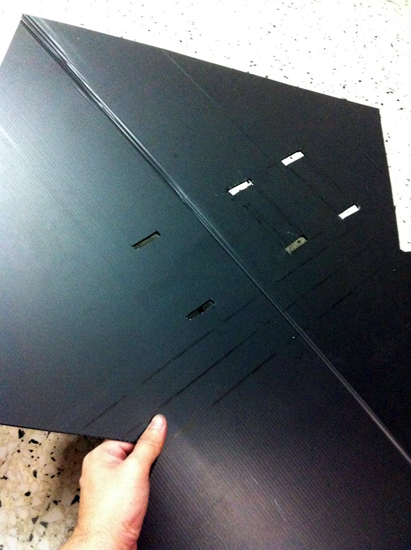 Replicate the base shape of the shield on a piece of PP board. Cut it out using a box cutter. Make sure you’re cutting it along, rather than against the grain. Locate the middle of the shield shape, and crease it in half down the middle. This ensure that your shield is capable of bending and conforming to shape later on. Finally, cut slits into the PP board approximate to where you intend to mount the shield straps. Make sure you cut three pairs of slits! 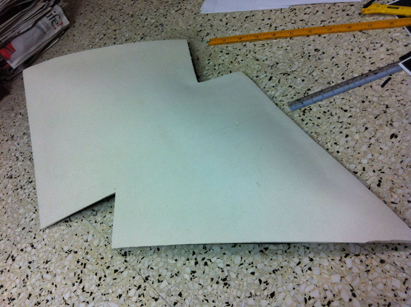 The PP board base, after folding and with slits cut from the base form. 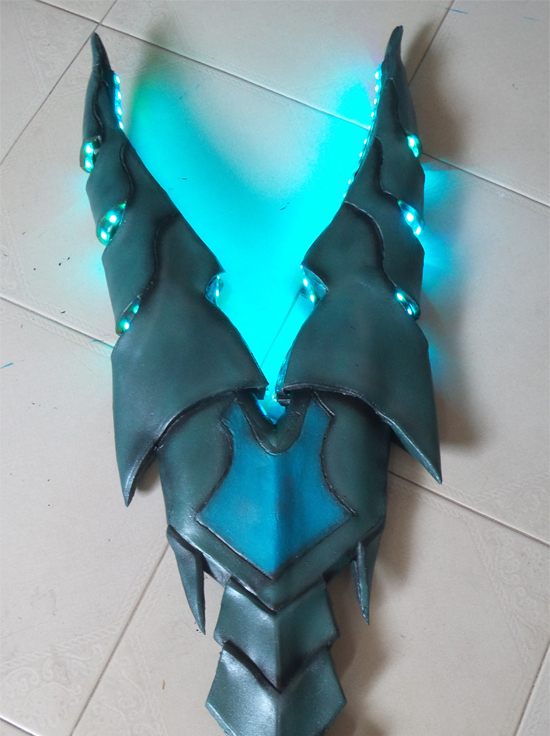 Most cosplayers don’t often realize that you don’t just have a pair of straps affixing the shield to your forearm, but also an additional strap that functions as a handle, so you can hold onto your shield firmly and to keep it in place while fighting. It’s incredibly important, especially if you want your shield to be stage ready! 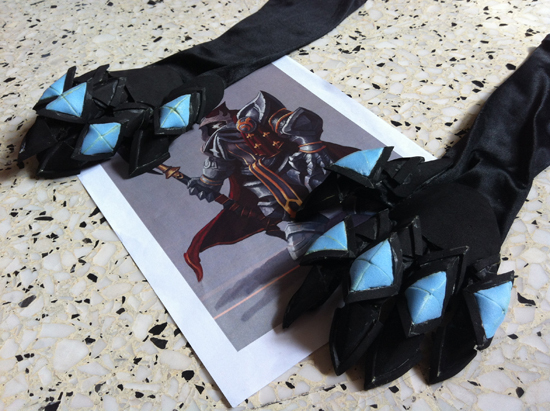 Now, it’s time to incorporate the straps into your shield. 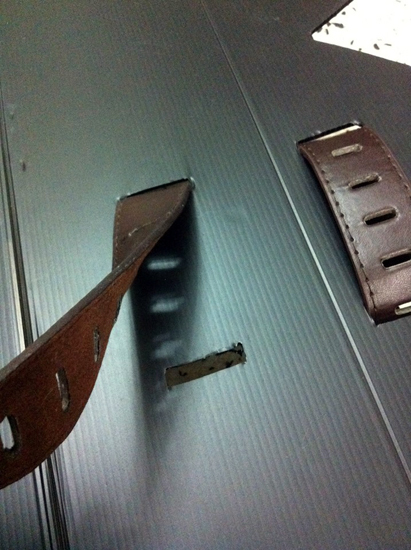 Thread the leather belts (Daiso belts are okay) through the slits. Make sure the belts loop through the shield like so. The buckle of the belt should be on the lower of the two slits. Make sure to give it enough allowance so the strap can fit snugly around your forearm. 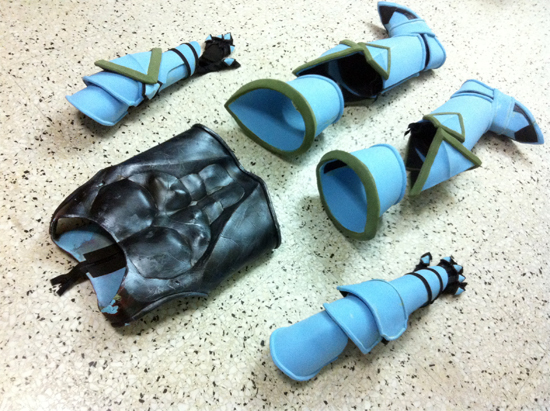 Be sure to leave enough space for any bracers or gauntlets that you might also be wearing with the prop. 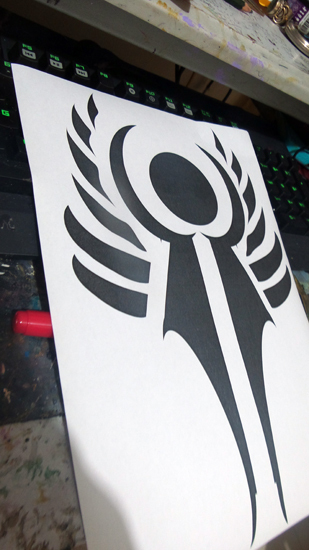 Here’s how it looks like on the side that’s going to be the back of your shield. Trim off any excess lengths from the belts after. 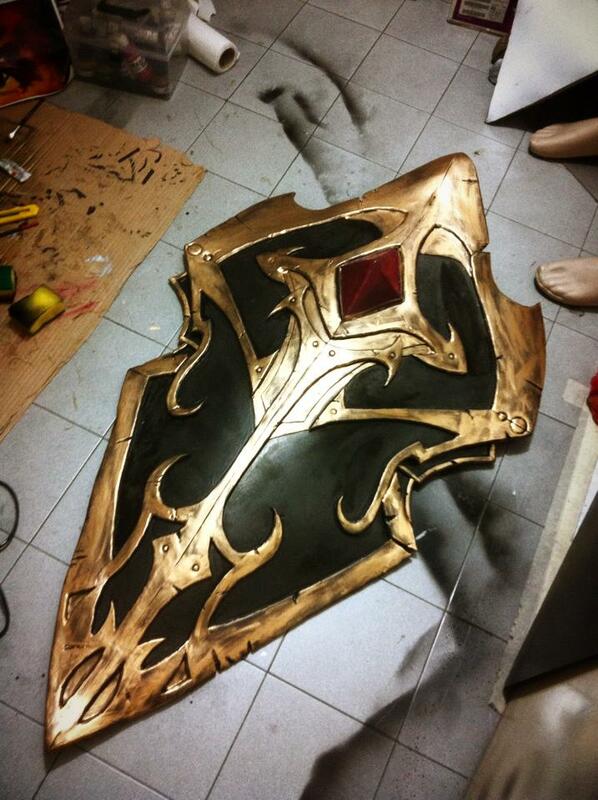 Cut out a large enough piece of foam to cover the front of the shield. Apply about 1-inch (approx. 2 cm) of contact glue all along the edges of the PP board, and also on the foam cutout. 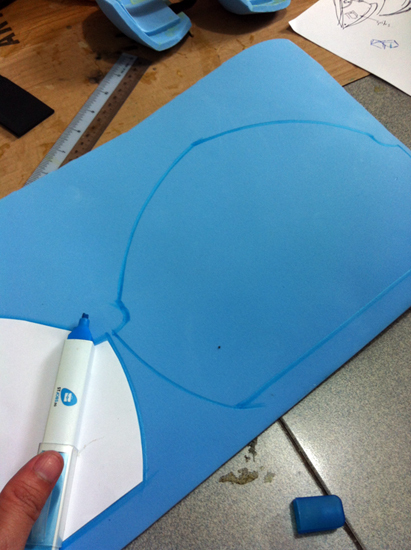 With the PP board held slightly bent along the middle crease to create an arch, start pasting the foam down. Once the glue is dried, the shield will retain a slightly curved shape. The thickness of the EVA foam and it’s inherent tensity will help your shield retain it’s shape once it’s properly glued on. How cool is that? Cut out any adornments and filigree you may have intended to add to your shield design, and paste them on using contact glue. 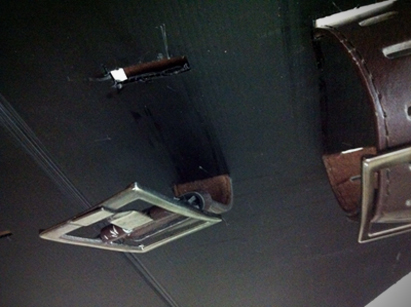 We also added paper fasteners to create ‘rivets. We’ll normally also duplicate the artwork onto the shield base, so we have handy guides for where to paste individual pieces. 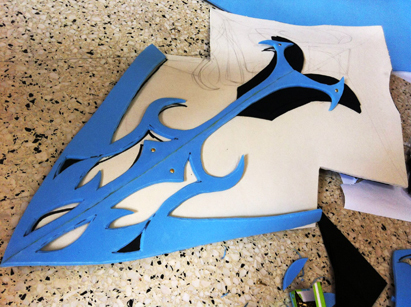 Start creating shapes out of foam and pasting them on. 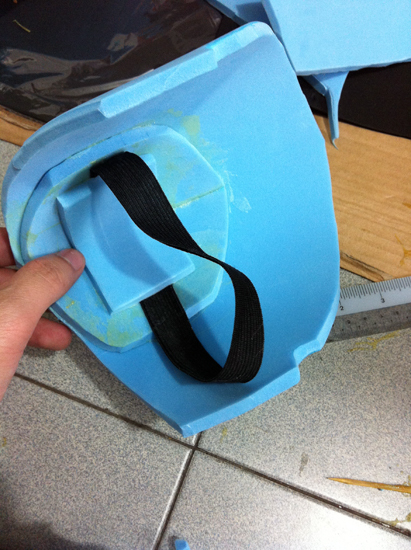 You can vary the thickness of the EVA foam you use to create differentiation and add variety to your design. 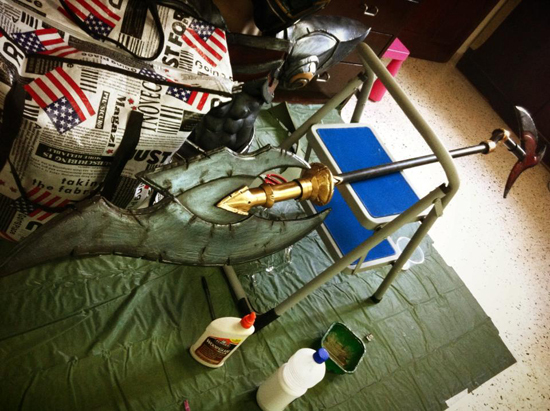 When all the elements of the shield are pasted down, it’s time to prime and paint! 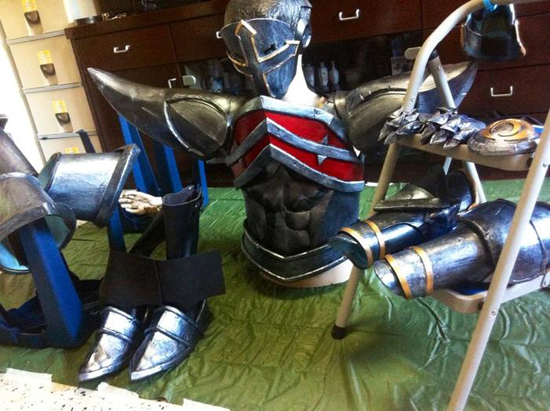 If you’d like to find out more about priming armor and props, check out this tutorial. We usually coat our props with three layers of PVA. If you expect your shield to see a lot of stage use, consider using five. Finally, give it a nice, shiny coat of paint and weathering, and you’re done! What do you think of our shield tutorial? Be sure to leave us a comment here or on Facebook! We’ve been working on new costumes non-stop this year, and two of our most fun and challenging ones are from American developer S2 Games latest 2nd-gen MOBA title, Strife. The game recently entered Closed Beta, and boasts an array of impressive character designs reflective of it’s meta world – five different planes with varying thematics ranging from the medieval to the technologically advanced. We were invited to help S2 Games bring some of these characters to life when we won the cosplay competition at Campus Game Fest last year, and these costumes will be making an appearance at PAX East in Boston this April where we’ll be guest-judging the cosplay competition and also participating in a variety of promotional events and activities. Here’s a quick look at what we’ve done for one of the game’s iconic characters – a psychic assassin from the plane of Vorbis named Minerva. 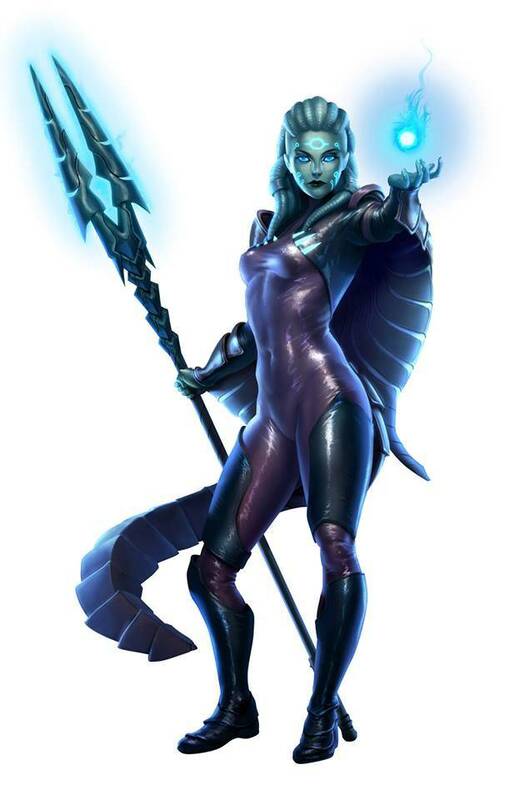 Minerva design by S2 Games. The design for the character meant that we had to get creative with not just body paint, but also a different variety of materials and fabrics. 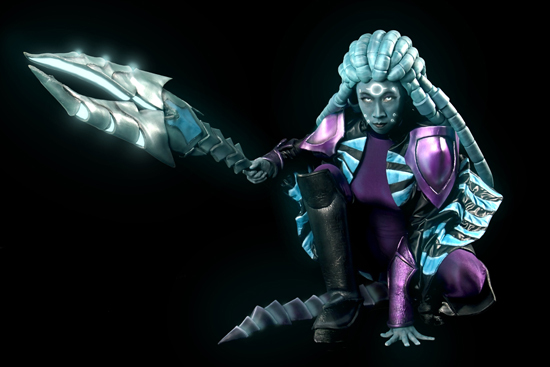 We’d also have to utilize LEDs to get the effects with her weapon prop just right. 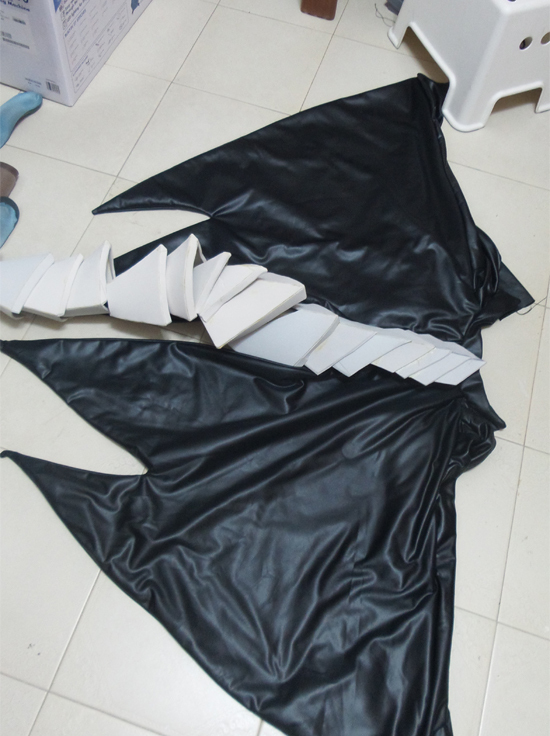 Because we’re most experienced with foam, we decided to tackle the armor pieces and Minerva’s tail first. 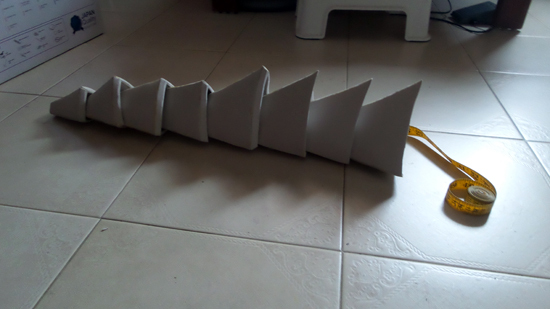 The tail was segmented out of individually cut foam triangles. We planned for the tail to be reticulated, so it can move freely and naturally while Angelus moved. 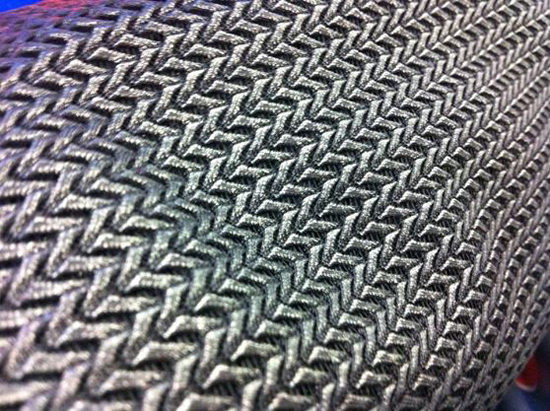 The effect was accomplished by having each individual segment slide into each other, and securing with velcro. 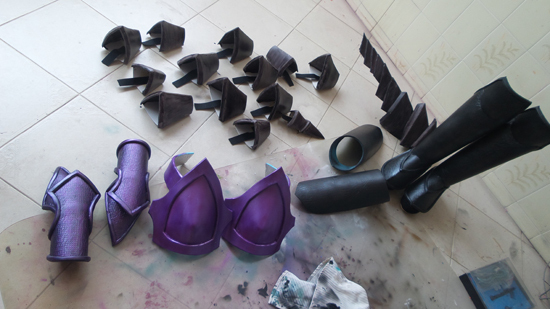 Bracers, Pauldrons, and other assorted portions of the armor. 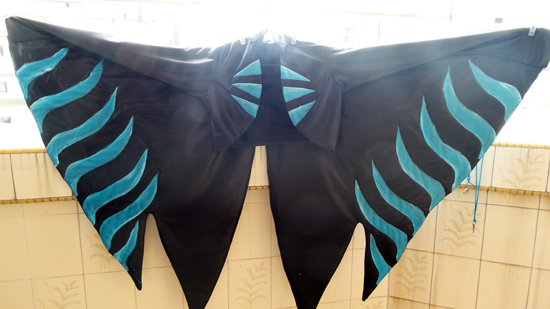 We’ve also painted the tail segments too! Minerva doesn’t don as much armor as we are normally accustomed to, but that’s also a good thing. It means we can create a more mobile and flexible costume, so Angelus can push her poses. A closer look at the headdress. Like Kerrigan’s wig, Minerva’s hair is a mass of organic tentacles. 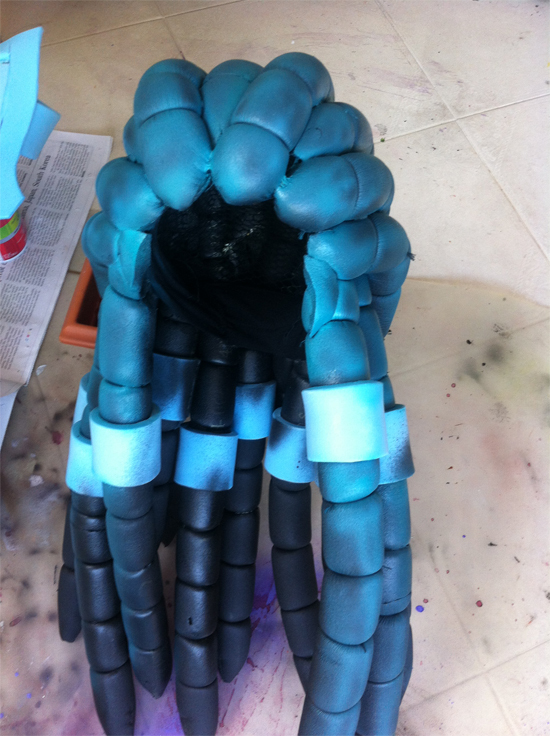 We decided that we’d build a headdress out of foam tubes layered over one another, joined to a knit mesh that’s normally used for sewing wig wefts. As for Minerva’s body suit and jacket, they were built as separate pieces. The jacket was crafted from pleather, with additional panels to create the cape-like structure behind her. 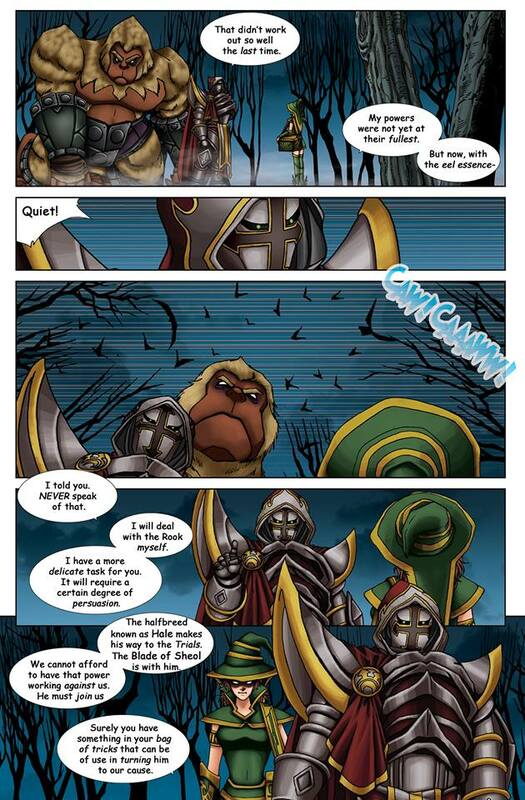 With additional colored panels added. Then there was Minerva’s polearm. It was made to be detachable so we could ship it over to PAX in a supply case, and LEDs were inserted to give it a cyan glow. 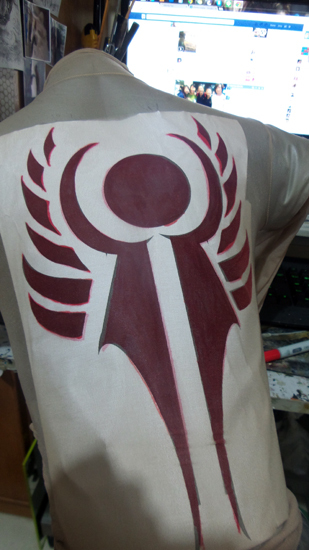 Using an airbrush to apply body paint is tricky, but it creates a more even tone compared to hand brushing. And here’s the completed ensemble from our studio preview. 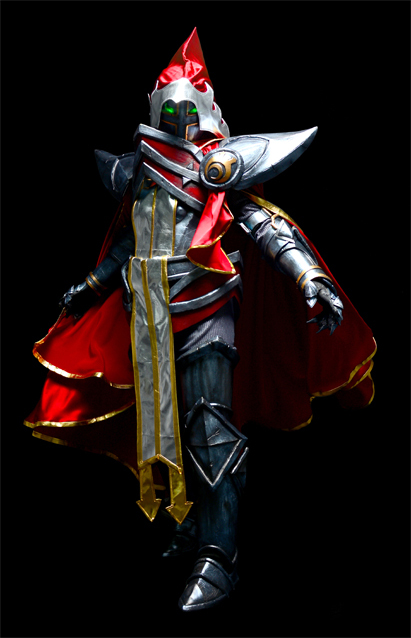 Don’t forget to leave a comment so we know what you think of Angelus’s costume. We’ll also be blogging about our work on Crimson’s MidKnight cosplay, an armored warrior who made his debut in the Strife comic book next week! If you’ve got a hankering to cosplay a character with tats, but don’t want to go with body paint or more painfully, the real thing, we’ve got some news for you. Angelus was working on some new costumes recently, and chanced upon a pretty quick and easy method for making some fairly credible tattoos out of, get this, old body stockings and permanent markers. 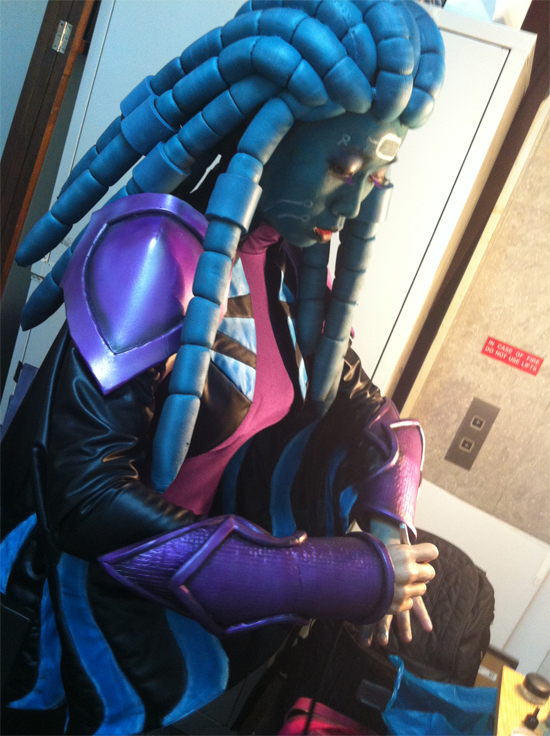 Executive Assistant Iris – Just one of our geeky part-time warrior’s newer cosplay projects. 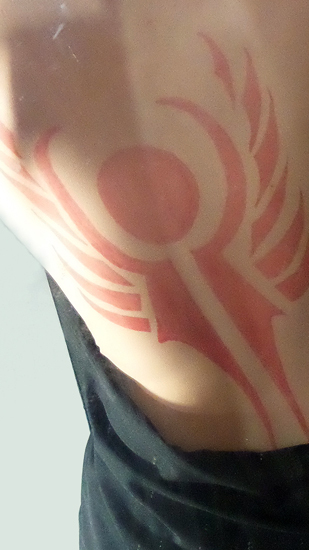 Make sure you have a clear printout of the tattoo you want to replicate for your cosplay. Affix it to your body form so it doesn’t shift or move from where it’s supposed to be. Stretch your stocking over the body form. Make sure the body form conforms to your relative body size. Be sure to pull it taut so there are no unruly bunches or creases. Make sure you pull the body stocking taut. Make sure you position the stocking over the image, because you’ll be tracing over the image next. 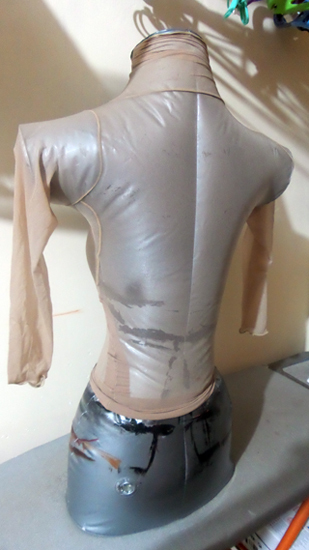 Here’s how it looks like when you’ve wrestled the body stocking into place. 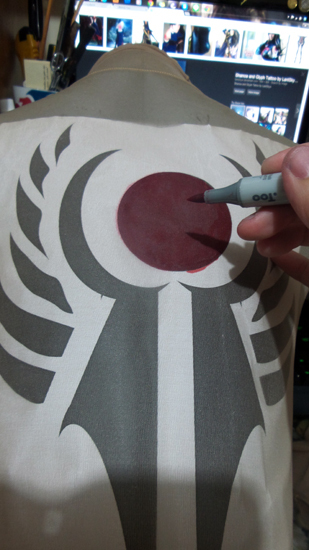 Using the printout as a guide, draw out the tattoo onto the stocking with a permanent marker. We’ve discovered that both Copic markers and Zebra pens are great for this. Color in all the areas carefully. Go over the edges of the artwork first, and then color in the insides. Don’t worry about smears or excessive ink seepage, because the paper printout will absorb most of that. Once you’re done, you can either leave the freshly tattooed stocking to air dry, or speed up the drying process with a hair dryer. Carefully remove the stocking from the body form, and it’s ready to wear! How’s that for a temporary tattoo? It photographs pretty well too! Don’t forget to let Angelus know if you think the tutorial is useful by leaving a comment! We were contacted by the Otaku House Marketing team following our article about a brewing PR incident after several posts were made on their Facebook page. The posts were found to be disparaging and deemed offensive by the cosplay community. The Otaku House Marketing team drew our attention to a statement they had issued on Facebook (refer to attached image, also replicated here on their blog) in which they “CONDEMN all those rude posts and comments made on cosplayers” (this condemnation was also reiterated in their email to us). Source: Otaku House Facebook Page. Otaku House issued this statement at around 12 noon Singapore time. From Otaku House’s statement, we gathered that they were the victims of hacking, possibly due to a recent password leak. They claimed the attack could have been the handiwork of a disgruntled contestant, and also declared that it couldn’t be the work of a rogue admin or any other member of their team. The offending posts have since been removed. Still, it’s puzzling as to how said hacker might have been so well-versed in cosplay to have been able to rile up the community by pushing all the right buttons, and we’re sure many of our readers and followers in the cosplay community are curious too. We have since replied Otaku House’s email, seeking a credible quote from their marketing director or perhaps a senior executive who might choose to officially make a statement and come on the record. I’m always heartened when corporations decide to embrace cosplay and pop-culture. With corporate backing, cosplay has evolved from mere hobby into a viable career for those who have managed to distinguish themselves through their craft. Some companies have done this well, engaging cosplayers as ambassadors and endorsers for their products and services, allowing them to tap a previously untapped niche in their marketing efforts. Sadly, there has also been an alarming trend in companies jumping aboard the cosplay bandwagon, a bandwagon that, if poorly handled, could easily crash and burn. At about 3 am today, the Facebook page of Singapore-based costume retailer Otaku House shared an image link disparaging a plus-sized Chun Li cosplayer. This was picked up by Lyeric, a respected cosplayer, costume maker and CrunchyRoll Ambassador from America, and disappointment began to spread. Source: Image replicated from Lyeric’s cosplay page. Shortly after, in a move reminiscent of Amy’s Baking Company, Otaku House issued an apology in poorly worded English, claiming that they had been hacked. Source: Otaku House Facebook page. They made no retraction for their initial post, and insisted in a later comment that it was a management policy to review the standards of their online Otaku House Cosplay Idol competition (see attached image). As of 9 am this morning, the company has yet to recant it’s stance or issue another formal declaration. It seemed like it was business as usual, with routine posts (likely scheduled) of Cosplay Idol finalists appearing on Otaku House’s Newsfeed. Otaku House isn’t the first company to commit a PR faux pas that could alienate it’s target market. Between 2007 and 2008, Odex was embroiled in a PR disaster that anime fans in Singapore have lovingly termed Xedo Saga. Prior to that, Singapore Cosplay Club, through SCC Square, had attempted to trademark the word ‘cosplay’ in a classic case that’s now considered textbook material, resulting in unhappiness both locally and abroad. Traces of the debacle can still be found on SGCafe. 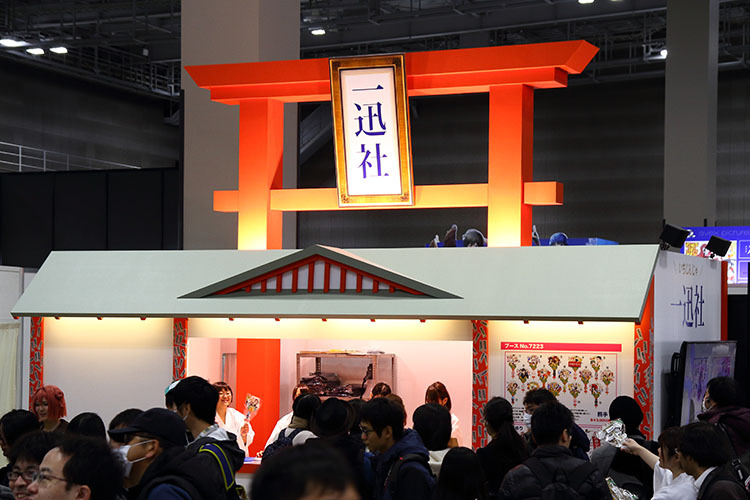 Marketing language notwithstanding, Otaku House has indeed gained prominence in the past three years, having implemented an online Cosplay Idol competition which has not only broadened their reach, but also carved a fair niche in the cosplay scene. The Cosplay Idol competition is an online competition where cosplayers submit their photographs. These photographs are then shared through Otaku House’s social media channels and website, and voted on by the public, who must ‘Like’ Otaku House’s social media channels to do so. Numbers on Otaku House’s social media channels have ramped up exponentially since it first ran this annual contest. Now, Otaku House’s Facebook page alone boasts more than 500,000 followers comprising both cosplayers and their fans. It’s a healthy number, and all it takes is for a simple lapse of judgement and poor management decisions to send all the hard-won goodwill crashing down. From an academic standpoint, this case proves an excellent study in the application of public relations and marketing strategies to a niche audience. In a cosplayer and event organizer’s perspective, it’s also a cautionary tale for the future. It’s undeniable that cosplay is a fundamentally visual hobby, but standards and valuation should be placed entirely in the hands of cosplayers and the community, not defined by the management of a company that has, heretofore, announced no particular criteria for the competition. This sudden change, which comes after several years and a sizable milestone is nothing if not alarming. Already, cosplayers are questioning the motives of Otaku House and their competition in the first place, with some even wondering if cosplayers are just statistics or numbers to pad their page ‘Like’s. The statement has not only been deemed generally offensive, but also discriminatory when they have, until this morning, included finalists who were males cross-dressing as female characters. This also exacerbates a perennial problem in online cosplay competitions, which are little more than popularity contests reliant more on face value, the number of friends you can mobilize and the size of your wallet, as opposed to the nature of cosplay as a performance art and a craft. We will be certain to watch the developments with interest, and posting our observations as it unfolds. Celebrate cosplay at GE3 as we bring you an epic competition featuring attractive CASH and computer peripherals prizes! This contest is open to any cosplayer(s) who visit GE3, regardless of nationality or country of origin. GE3 staff and their immediate family members are not eligible to participate in this competition. Pre-registration for this competition is required (see below). As there are only a limited number of competitor slots available, do consider registering early to avoid disappointment. You may choose to enter as either a Solo Entry or Team Entry. Each team is limited to a maximum of 3 participants. If you choose to enter as a team, performing members must cosplay from the same title. Characters may be from any game on the PC, Console (Playstation, Xbox, Wii), hand-held game device or mobile device, from anime, comic books, manga or movies. Characters from games and from partner titles (e.g. 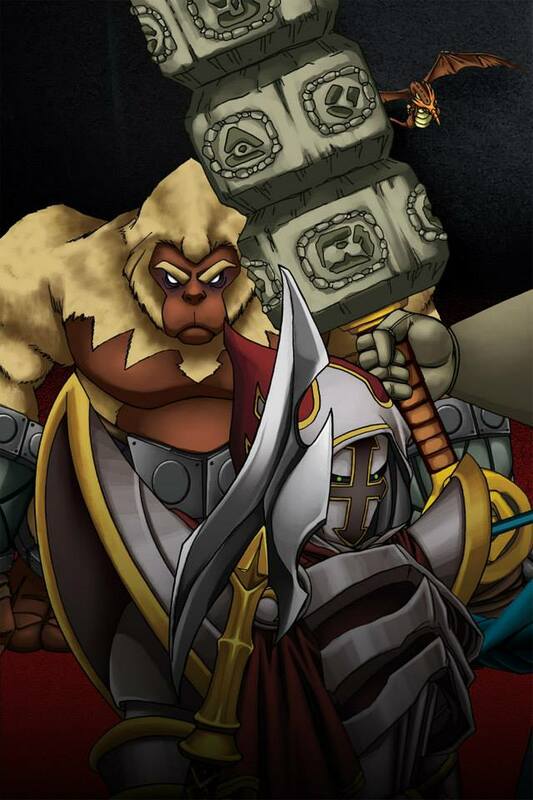 Blizzard titles and DotA 2) will receive bonus points. You must provide the title of the game, the name of the character(s) and a reasonably good quality, full length image of the character(s) you intend to cosplay. The image(s) will be used as a reference image during judging. You may choose to do anything you wish on stage, from putting on a skit, to singing and dancing, or simply through doing a series of poses and actions. You are given between 1 minute to 5 minutes to do so. (The depth of the stage is approximately 2.5 m. Do keep this in mind when planning your performance). You may (and are encouraged to) provide an audio track during this performance. The usage of confetti, fire effects, party poppers, pyrotechnics, or liquids on stage are strictly NOT allowed. GE3 reserves the right to use any images, video clips, audio clips and footage of any participant’s costume and performance with impunity, and retains these rights before, during and after the competition. Any infringement or failure to comply with the rules and regulations will result in immediate disqualification from the competition. Bonus Points: 5% for game characters, and additional 5% for characters from featured games. i.e. Battlefield series, Counter Strike, Blizzard titles, DotA 2, Pokemon, Street Fighter. The Deadline for Registration is 22 December 2013. If you are selected, you will receive email confirmation on 23 December 2013. Do check your emails regularly! Contestants should report to the D’Marquee from 12 noon onwards with your costume and valid proof of identification for a briefing. Please try to be punctual. Judging for this competition takes place in two phases – pre-judging and performance phase. You should be ready by 1 pm for pre-judging. Pre-judging will take place at the mini-stage and will factor into your Costume Accuracy and Craftsmanship. The performance phase of the competition will begin promptly at 2.30 pm at the D’Marquee main stage. You will be ushered to the main stage by our staff. During the performance phase, all competitors will be given up to a maximum of 5 minutes of stage time to impress the judges (see above). Results will be tabulated at the end of the competition, and prizes will be presented during the same time slot. All contestants will be invited on stage for the curtain call and prize giving. The organizers of GE3 reserve the right to change the rules and regulations of this competition at any time.